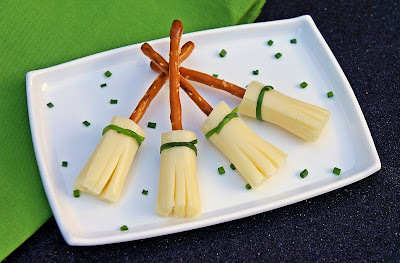 Using kitchen scissors, cut the ends off each string cheese stick (about 2 inches long). Cut one end of the cheese into strips, being careful not to cut all the way to the top. Fan out cheese strips as best you can. Take one side of the scissors and gently stick it into the uncut side of the cheese, to make a little hole for the pretzel. Slowly twist the pretzel stick into the hole, careful not to tear the cheese. Tie a string of fresh chives around the top of each cheese piece. Enjoy!